Travel and hotel booking industry is growing at the rapid pace and today peoples are showing interest in online booking. In this business market, plenty of hotels booking application are available but these apps are high cost. 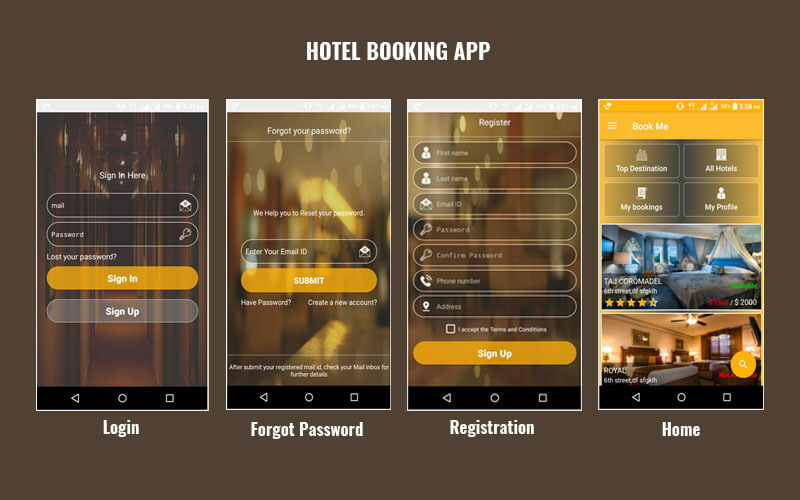 So Phpscriptsmall especially developed a Hotel Booking Android App for easy online hotel booking with cheap price and best features. The user can easily book hotels from the home at the best pricing by using your Android Smartphone. The user needs to provide their basic details like name, phone number, address and login with the valid username and password. In the home page, the user can see the top destination, all hotels, my bookings, and my profile option. The navigation menu is present in the main page which follows home, search, top cities, all hotels, my profile & booking, and logout. The customer can search the hotel by top cities, check in, check out, adults and more on. After the advanced search users can see the list of hotels with the detailed information like hotel name, overall ratings, address, images, contact information etc. To book the room, the customers need to click book now button and the user needs to enter necessary details to book the hotel and click the confirm button to confirm their booking. The visitor can write a review and give ratings to the hotels by clicking give rating button at the bottom of the page and they view the ratings of the hotels also by clicking the icon in the top right corner of the page. In the booking menu, the user can see the booking details with hotel name, booking date and time of the booking. The important features of our Hotel Booking Apps for Android are advanced search option, location and hotel management; secure source code, attractive user interface, booking management, profile management, cart, checkout, category management, reviews & ratings, order history and details and more on. The benefits of using our Hotel App for Android are finding and booking your ideal hotel, easy and last minute of hotel bookings, provides maximum information about the hotel as customer needs, and many others. We are leading web development and android mobile application development company, offering different types of android application to the clients with best features. Phpscriptsmall provides extra business offers to the clients for 1-year technical support; 6 month free updates of the source code and brand free Multi Hotel Booking Android Application. Our mobile application plays an important role in the hotel booking industry business. Excellent platform for the hotel entrepreneurs, appreciable services from the support team. Execution and output was brilliance. Got full APK source code! Backend was PHP and MySQL so that easy to customize according to the business needs.